We’d love your help. Let us know what’s wrong with this preview of Best Words, Best Order by Stephen Dobyns. In this new edition of Best Words, Best Order, Stephen Dobyns further explains the mystery of the poet's work. Through essays on memory and metaphor, pacing, and the intricacies of voice and tone, and thoughtful appreciations of Chekhov, Ritsos, Mandelstam, and Rilke, Dobyns guides readers and writers through poetry's mysterious twilight communiques. 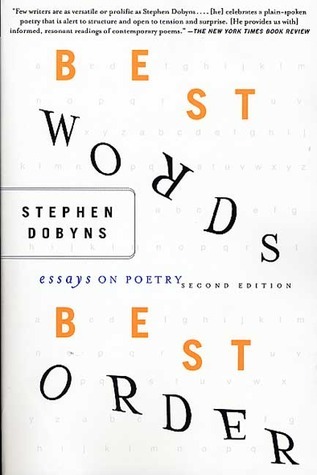 For this new second ed In this new edition of Best Words, Best Order, Stephen Dobyns further explains the mystery of the poet's work. Through essays on memory and metaphor, pacing, and the intricacies of voice and tone, and thoughtful appreciations of Chekhov, Ritsos, Mandelstam, and Rilke, Dobyns guides readers and writers through poetry's mysterious twilight communiques. For this new second edition, Dobyns has added two new essays, one dealing with the idea of "beauty" in poetry and another dealing with the almost mystical way poets connect seemingly disparate elements in a single work. To ask other readers questions about Best Words, Best Order, please sign up. To be honest, I found large sections of this book of no interest to me. Dobyns wrote many long essays on individual authors that I skipped. However, when he wrote in general terms about the purpose of poetry, what makes a good poem, the magic of metaphors, the importance of pacing, tone, engaging a reader, etc., he was singing my song. I found this book less compelling and intellectually concise than Czeslaw Milosz's The Witness of Poetry (Milosz), but also less interfering between reader and poem (and thereby slightly condescending) than Edward Hirsch's How To Read A Poem (Hirsch). Mostly, this is an excellent read into the evolution of free verse -- something every contemporary poet should understand; this is our heritage. This was a good reference book to start my journeywith poetry. I enjoyed ch 1-8 the most. ..interesting, but not what I was looking for. I skimmed these chapters. The last 3 chapters dealt with Time, Participant in a poem and Beauty. Conclusion: Prepare yourself for a long read. Sift the information to your own needs. Don't read a poem and go after it as if it were an item on a final exam. Poem: it is the experience...not This was a good reference book to start my journeywith poetry. I've read this book two or three times. Since I don't remember a lot of it, I'm probably due to read it again. One thing I remember is that there is some coverage of Rilke's work ethic. Rilke learned from working with Rodin that one must go to work as a craftsman. Yet Rilke was not above needing inspiration as the raw material on which to work. I've probably assimiliated much of this book and no longer know know which of my opinions are based on it. My recollection is that it had a lot of insight I've read this book two or three times. Since I don't remember a lot of it, I'm probably due to read it again. One thing I remember is that there is some coverage of Rilke's work ethic. Rilke learned from working with Rodin that one must go to work as a craftsman. Yet Rilke was not above needing inspiration as the raw material on which to work. Very useful for serious writing. The chapters on Free Verse, Metaphor, Pacing, and Tone were all quite interesting, the first being the longest and best. I took notes, underlined and highlighted frequently. I believe there are some wonderful insights here which will make me a better poet if I'm able to make them second nature. Like many of the other reviewers here, I found the chapters on individual poets rather boring and in skipped two of them. The one on Osip Mandelstam was personally interesting to me because I like Mandelst The chapters on Free Verse, Metaphor, Pacing, and Tone were all quite interesting, the first being the longest and best. I took notes, underlined and highlighted frequently. I believe there are some wonderful insights here which will make me a better poet if I'm able to make them second nature. Like many of the other reviewers here, I found the chapters on individual poets rather boring and in skipped two of them. The one on Osip Mandelstam was personally interesting to me because I like Mandelstam's poetry, but that doesn't mean that chapter would be any less grueling for another reader. The ending essay regarding Beauty started off in a promising way, but it quickly devolved into an academic debate between Dobyns and Elaine Scarry. Scarry is actually a professor I'm familiar with as I deeply enjoyed her book The Body In Pain, but the discussion Dobyns is having regarding her views on beauty is deeply uninteresting, especially when reading a book supposedly devoted to the craft of poetry. I started with the chapters on Free-Verse and the bit on Cemetery Nights. Neither shows this author at his best, yet slowly but surely I warmed up to him by the end. He has a very good, healthy view of poetry as that purveyor of the transcendent through the immediate. I loved many chapters, such as Pacing, Tone, the Voice, and especially Manipulation of Time. Always solid when talking about beauty. Not very dense and a lot of intriguing possibilities. Not something that inspires me to write poems I started with the chapters on Free-Verse and the bit on Cemetery Nights. Neither shows this author at his best, yet slowly but surely I warmed up to him by the end. He has a very good, healthy view of poetry as that purveyor of the transcendent through the immediate. I loved many chapters, such as Pacing, Tone, the Voice, and especially Manipulation of Time. Always solid when talking about beauty. Not very dense and a lot of intriguing possibilities. Not something that inspires me to write poems as much as to read them. I've always wondered what separates good poetry from bad, especially when it comes to free verse. This book answers that question through a series of dense but insightful essays that describe intellectual and emotional engagement with metaphor, diction and rhythm, as well as providing a history of free verse development. I particularly enjoyed the two essays that described how and why a specific poem was written and revised. Another great read. Thanks, Deja. This is a poet's book. And poetry in the author's opinion, is a reason to love being alive. The book goes from details on the craft to synopses of the styles of a chosen few, to an example of one of the author's own. A superb read!Thank you, Stephen Dobyns! There are times in these essays where Dobyns loses sight of his goals, allowing for the biography of writers to take too much precedence, but his thorough discussion and explanations of prosody, of beauty, and of the history of poetry is both erudite and well presented. Best words, best order. I think I got more from the title than from the book. I wanted to like this. I generally like Dobyn's poetry. But I found this tough slogging. Dobyns has an unusual way of looking at poetry that is at once historical, formulaic, and metaphysical. This is a great collection of essays on poetry. An amazing collection of essays on poetry. Dobyns was raised in New Jersey, Michigan, Virginia, and Pennsylvania. He was educated at Shimer College, graduated from Wayne State University, and received an MFA from the Iowa Writers' Workshop at the University of Iowa in 1967. He has worked as a reporter for the Detroit News. He has taught at various academic institutions, including Sarah Lawrence College, the Warren Wilson College MFA Program Dobyns was raised in New Jersey, Michigan, Virginia, and Pennsylvania. He was educated at Shimer College, graduated from Wayne State University, and received an MFA from the Iowa Writers' Workshop at the University of Iowa in 1967. He has worked as a reporter for the Detroit News. He has taught at various academic institutions, including Sarah Lawrence College, the Warren Wilson College MFA Program for Writers, the University of Iowa, Syracuse University, and Boston University. In much of his poetry and some works of non-genre fiction, Dobyns employs extended tropes, using the ridiculous and the absurd as vehicles to introduce more profound meditations on life, love, and art. He shies neither from the low nor from the sublime, and all in a straightforward narrative voice of reason. His journalistic training has strongly informed this voice.